BBT-059, a long-acting interleukin-11 (IL-11) analog, stimulates production of platelets, which are a type of blood cell critical for blood clotting. IL-11 products are used to treat thrombocytopenia (low numbers of platelets), which can lead to uncontrolled bleeding, and is a frequent side-effect of chemotherapy treatment in cancer patients. IL-11 has shown promise in clinical trials for treating a number of bleeding disorders in humans, but requires repeated, daily injections for efficacy, reducing its attractiveness as a product. Due to its longer uration of action, BBT-059 may prove effective for these diseases when administered once per week or less frequently. 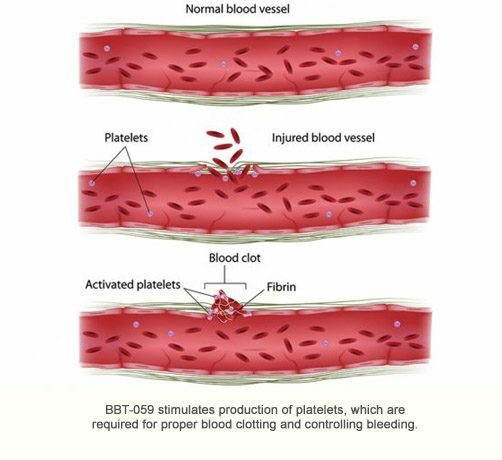 BBT-059 also is being investigated as a potential treatment for Acute Radiation Syndrome and ischemia-reperfusion injury.